Inspired by a blog post by Patrick Dunleavy about citation practices in different disciplines I wanted to update my understanding of which journals belong to the top of my discipline, demography. Traditionally I have checked this using the impact factor scores listed in ISI Web of Social Science’s Journal Citation Reports under group “Demography”. I knew that impact factor is in fact quite a bad indicator of a journal’s prestige, but I kept focusing on that anyway. I simply assumed that everyone else was doing that as well and thus the socially constructed understanding of which journals are the best ones would be based on impact factor rankings despite its problems. As a young researcher I have to be constantly thinking about my CV and I thought submitting to journals that rank high on this indicator would impress a potential employer reading my list of publications. However, Professor Dunleavy wrote that anyone still looking at impact factors is “mathematically ignorant”, whereas h-indices listed in Google Scholar’s Metrics are “robust and meaningful average indicators”. In addition, he said that coverage of social science journals is much better in Google’s than ISI Web’s database. Consequently, I decided to see what Google Metrics had to say about demography. Unfortunately Google Metrics does not have a subcategory for demography, so I was only left guessing whether the coverage actually is any better in my discipline. Instead, I decided to search for the top 20 journals listed by ISI Web and see what happens to the rankings when h-index is used instead of impact factor. 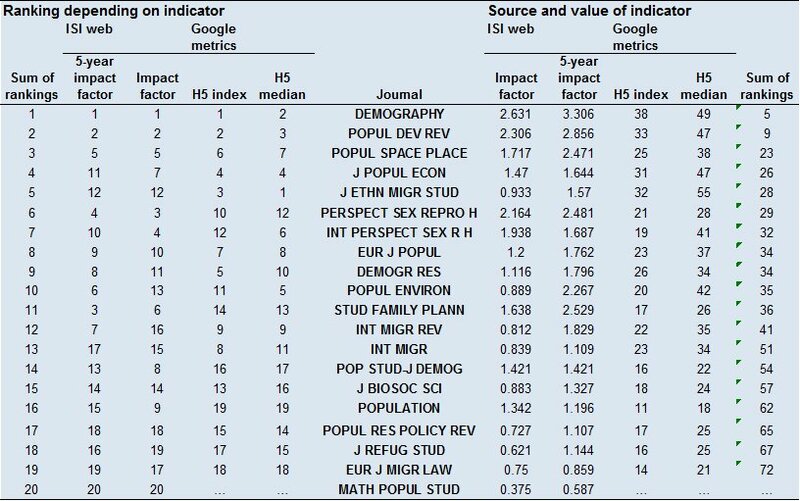 The table below shows that regardless of the metric the top two journals in demography are Demography and Population and Development Review. There is more variation in the raking of other journals, for instance the open source Demographic Research’s rankings vary from 5 to 11 and the London based Population Studies’ from 8 to 17. So, what did we learn from all this? Where should I submit my next article? I guess we are still in search of the perfect metric and journal database, but the results seem to be fairly robust at least when it comes to the few journals at the very top of the rankings. If one wants to maximise the h-index/impact factor of their publications, and happens to work in an interdisciplinary field like demography, they’re probably better of publishing in journals listed under other disciplines, such as sociology (e.g. American Sociological Review has H5 index of 47) or epidemiology (e.g. H5 of American Journal of Epidemiology is 73). I guess in the end it all comes down to varying citation traditions discussed in Dunleavy’s blog post. Perhaps we all should just start vigorously citing research published in our field?